Hi Ed, I checked in on the state of the roadmap and nothing like this is planned. Kristina. I hope you are not Kassandra. Have a look into Greek Mythology and the Trojan war. Kristina, from my point of view this method (that we also are forced to use) is just a workaround for a JAMA limitation. If you are satisfied with it then Excel become a mandatory tool for using JAMA. And this is just one example, editing test steps is even worse and again Excel is a must. Note: This conversation was created from a reply on: Can I search and replace a string in a whole project. Manel, I agree with you that it is a workaround given there is no Jama feature or function that accomplishes the task. I'll branch your reply into an Idea post so that we can consider it as such! I agree with Manel. Search and replace is a very basic feature, in absence of which requires lot of manual efforts. Moreover, there is nothing like exclusive edit, that allows to edit all the test cases at one go. I have to go to each test case, then click on edit, then edit it. It makes work more tedious and time consuming. 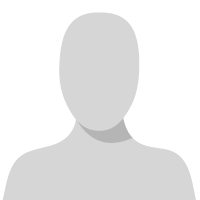 This reply was created from a merged topic originally titled Find and replace. It would be good if there is a possibility for Find and Replace within a text field. When there is long text this function helps to do all changes / replacements as quickly as possible. Thanks for the Idea, Vladimir. I definitely understand why you would need this—I'm just merging your Idea with another that exists for a true find-and-replace function. See image for relevant comments that were lost in the merge. 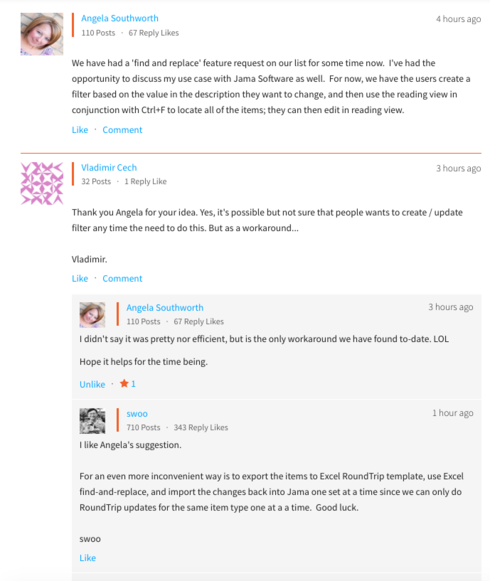 This reply was created from a merged topic originally titled Bulk Change for "Rich Text Field". Currently, Jama does not support bulk change for "Rich Text Field" like description (including other type of fields). Jama does have a workaround with "Excel round-trip" but lot of our users found it as time-consuming, error-prone, difficult to use, confusing Band-Aid. We would like to have feature like "Find and replace" certain text values from the selected filter. Can you let us know if you have any plan to add it in your upcoming release? At this point the ability to find and replace is not on the road map. Suffice it to say, I agree with you that while Roundtrip does get the job done, it is not efficient nor intuitive. Excel Round-Trip doesn't work very well with mixed item types, especially if there are large Richtext fields in some of them. Given that Jama already has a project level search function (so it can find all instances of a text string) would it be possible to replace all instances of the search term? We have a lot of users who would like this function. Frequently we don't know an official name upfront so we put a dummy name in like *FANCY_NAME_TBD* that needs to be replaced later. Or we change our mind and would like something to be updated in multiple places. The best workaround I've seen is to export to Word, and then use Word's find and replace function. Then import the word document back in and delete the old copy. This isn't a perfect fix either because it only works on description fields, and all the history of the item is lost. Also, it makes Word the copy of record and Jama just an incidental upload at the end of development, which isn't how we want Jama to be used. Can we get this on the roadmap? I checked in on the state of the roadmap and nothing like this is planned. What's the update on Search and Replace? I was astonished to find (ha) that there is no search and replace capability in Jama. It's a very basic function of a database and would simplify the process greatly (the exporting/edit round-trip to Excel is awkward at best). Case in point: We have a certain system component we a totally revamping for a next-gen project. I reused (without sync) the necessary requirements. Now to quickly search and replace the product name... oh dang! There is no update to speak of, although your use case is bound to be the most common one. We have had a little bit of feedback about this need, but it's not something critical, ergo it hasn't been prioritized. We are interested in finding out if there is an update from the JAMA team on this question. This would be a very useful feature when seeking to re-use groups of requirements on new projects - or elsewhere in the same project. We are having an internal debate on whether the Product Name should be included in the requirement text (description) and unfortunately, the awkward necessity of an excel round-trip is affecting pro-con calculus. In my mind there is significant advantage for this "best practice" of using the product name in the requirement. This would be a valuable function for us, too. Trying to get all the test cases aligned with the same choice of synonym would be much easier if I didn't have to individually update each one. Round trip provides some of this functionality but is limited - as soon as bullet points are used or any real formatting round trip is no longer an option. We would also like to see this considered for inclusion on the roadmap for future development. We need more people to champion this feature - the Jama team seems more responsive to volume versus the "irritation factor". The Excel "workaround" is not useful if you make use of graphical content (a picture is worth a thousand words often applies to requirements). In my experience, anyone who reuses requirements and/or works with large numbers of requirements will get highly irritated when they discover there is no search/replace functionality. Agree with this need. As our product line grows, we reuse many components and associated specifications. Lack of search and replace hinders the efficiency of Jama's reuse features. This would be awesome. We oftentimes use a "code name" for our products as we don't always have their finalized name in place before we start writing requirements. It would be great to be able to replace all of those at once. I agree for exactly the same reasons as already detailed. We start a project with one name and may change names as it develops, sometimes more than once. Round trip through Word might be effective, but the best solution would be a built-in find and replace, which should not be hard to implement. Has anyone tried doing this through the API?